DSC_5893, originally uploaded by Midnight Matinee 24. Tri City Thunder in furious battle with CN Power in the last bout of Quad City Chaos 2011 on the last Sunday afternoon in March.The sun was out but the Thunder was in full force. And so it begins. Just around the corner too. No more warmups with Black & White or Cubs and Cougars. Becoming WFTDA Apprentice does that to you. The new look Dolls and the champion Gore Gore Rollergirls start things off on the 5th of February. CN Power kicks into action with the Killamazoo Derby Darlins from Kalamazoo. A fast and hard hitting team. Then Low Ride Her and company from Sister Slag fresh from Blood & Thunder represent Nickel City Roller Derby all the way from Sudbury against the D-VAS. Then after the March 12th Match with the season debut of the black and blue Smoke City Betties with another infusion of rookie talent and Bruise Berry Pie marking her presence in ToRD going against the green of Chicks Ahoy! Really looking forward to the next Quad City Chaos weekend – bringing in RVRG Rideau Valley Rollergirls, MTLRD, TCRG [Tri City Thunder!]] and Toronto Roller Derby all facing against each other. Fans should come out to see a cross-section of Canada Derby talent. Hopefully Montreal will bring in the New Skids on the Block who were the real eyeopeners of last year levelling all the teams yet they are all so friendly. ToRD – GGRG vs. DTD – Season Opener! ToRD – GGRG vs. CA! In what was called a “clean” and “fun” match by jammer B.J. Harmstrong the Lake Effect Furies, the all-star team from the Queen City Rollergirls came to exact their revenge upon Canada. CN Power brought in a different band of sisters for this match than the one last eyewitnessed at Quad City Chaos back on March 27 and 28, 2010. For starters Dyna Hurtcha was on the bench with Sonic Doom overseeing new CN Power faces [but not rookies by any means] Betty Bomber [#23], Candy Crossbones [#2020], Foxy Sinatra [#13], back in action Monichrome [#35], Molly Boom [#XVII], Pretty Peeved [#26er] and a “pants on” Lucid Lou [#12:34]. 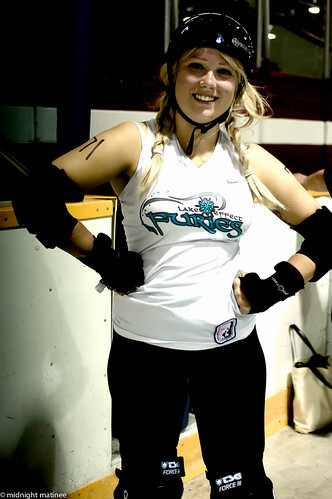 Returning for CN Power this bout against their counterparts from across the border included Brim Stone [#21:8], Dust Bunny with her Defecaitlin #2 number on, Lady Gag-ya at 212db, Mega Mouth [#26] this time, Nasher the Smasher [#2×4] and Rebel Rock-It [#7]. After the intro by Brawl as the Lake Effect Furies demonstrated their cool Ice Ice Baby choreography, CN Power were introduced as ever by Crankypants. Crankypants was in fine voice and spirits lauding the virtues of Buffalo down the highway and noting all the city contingents from Hamilton, Thames, and the newly formed Kingston who were all there at the steamy hangar to watch these two WFTDA Apprentice teams and trading off on mic with Queen City Brawl calling the action. He was wondering why there was no “Lindy Rough” on the Furies team. At the Hangar, the action proved to be fierce, fast and furious. The partisan Toronto crowd went wild when CN Power would achieve lead jammer status. Even if the Power were first off the mark they would face the tightknit defensive resistance of the Furies. The battle of jammer on jammer was close with CN Power building a lead. 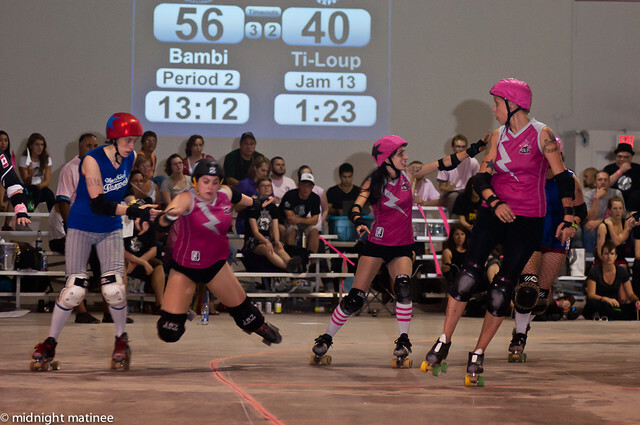 The feature matchup on jammer was CN Power Defecaitlin against the Furies Addy Rawl. As Addy Rawl, a former NCAA athlete, called it: “Defecaitlin was definitely a good match up for this rookie of the year [last year] as well.” However, the Furies chipped back and gained the lead with a first half score of 53-38. This was a night and day different game from the bout up in Tri-City where the first half score had been only 37-14 in favour of Tri City Thunder. In the second half the Furies was in solid game control mode, big hits with the indomitable Lip Service [#360] in sync with Argo [#19] along with Lamb Chop #71 to add the chop. The Furies had learned their lessons well about pack control from the Tri City match. Intent on “nickel and diming” to gain points and build their lead, the Furies tactics of quick stops and starts off the jam ground the hometeam down to a halt. “We definitely were trying to nickel and dime the points away from them, and it definitely seemed to work – but the CN Power had some really great jammers as well, it was such a close game in that aspect,” said B.J. Harmstrong. However, the CN Power never quit with veteran pivot Rebel Rock-It, Nasher the Smasher and the M&Ms Monichrome and and Mega Mouth in the pack blazing around the track building the block and wall for their own jammers Candy Crossbones, Brim Stone and Defecaitlin who scored her own 15 point jam. 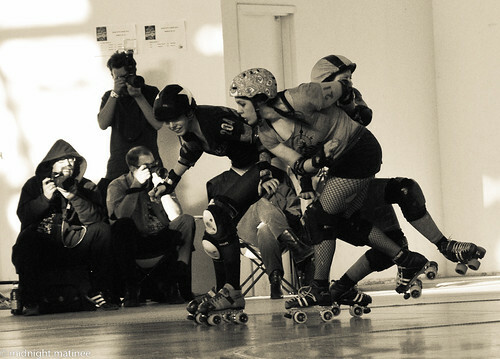 Going for broke, Brim Stone went down for the count in a knee down with a collision and nasty fall on her shoulder by the Furies Dr. Dementer over on corner three. The hit of the night was on Furies’s B.J. Harmstrong who had a spectacular fall but like all good bumbles she bounced back up. And just seconds later Lip Service laid the hit back on the Power. By the end, the Furies from Queen City like the Sabres always do with the Leafs prevailed over the CN Power by a 110-79 knockout count. It was a fun bout marked with clean play, and respect for each other. Late note: Congratulations to Lake Effect Furies for just a becoming full fledged WFTDA team now!